The Augsburg facilities management department faced a serious challenge. 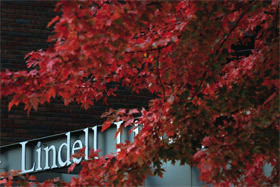 A cooling tower for the Lindell Library had begun leaking and electrical damage had occurred. The rub, however, was that the price for a new cooling tower was more than $82,000. And this unexpected cost had been neither planned nor budgeted for. Turned out there was a solution: eBay. Yes, that eBay. And the online auction Website helped Augsburg save more than $60,000. After receiving the initial bid to replace the cooling tower, maintenance manager Dennis Stuckey started looking around for an alternative to buying new. Were there other options? Could a used model be found? Stuckey put the manufacturer of the cooling tower and the model number into Google and was surprised at what he found. One of the search results was an eBay listing from reseller in Chattanooga, Tenn. While not the same model year, the company in Tennessee had the exact same model. Getting the cooling tower replaced was important in part because of the amount of IT infrastructure housed in Lindell. Stuckey had used eBay to buy a few things over the years. He bought some gifts and some collectables and spent between $200 and $300 on the site. He certainly hadn’t bought anything close to a cooling tower with a “buy it now” price of $12,000 on it. Part of the reason behind considering buying off of eBay was that Stuckey used satellite photography on the internet to pull up a photo of the unit on the ground in Tennessee. In addition, it was clear that the seller had used eBay with success. Because of that Stuckey flew to Atlanta and drove to Chattanooga to give the unit a visual inspection and record the serial number. The facilities department believes the cooling tower had previously been installed at a hospital and had been upgraded. David Draus, the facilities management director, said that the unit was such a fit that there was little work that had to be done aside from getting it in place and connecting it. And it saved the college a huge amount of money. Because after making the purchase, getting the unit shipped and installed by contractors here, the total price was $22,000–a savings of $60,000. “It hasn’t given us a problem since,” Draus said. The use of eBay at Augsburg isn’t limited to this example. For several years, the IT department used eBay as a source for purchasing new and used networking equipment. That allowed the college to save 50-60 percent off of the list price. The department now uses eBay much less than in the past because of the amount of products it purchases. But the college still takes advantage of relationships it formed on eBay. For example, the college buys a significant amount of hardware from an Eden Prairie company called C-Tech Online. The Augsburg IT department found C-Tech through eBay, according to Director of IT Systems Brad Christ. Now instead of buying on eBay, the college calls C-Tech directly and gets a quote. If a vital piece of equipment fails, C-Tech will use a courier to deliver the hardware within hours. The college spends about $100,000 per year on networking replacement and upgrades. Christ said if all of that was purchased new, the cost would be double or triple that.